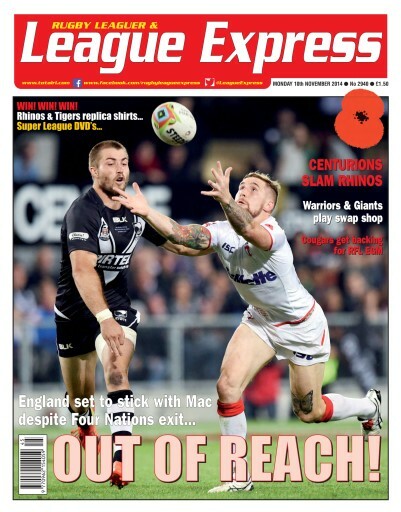 In this week's League Express we have match reports, photographs and analysis from the third round of the Four Nations tournament from Australia and New Zealand, and we look carefully at why England were unable to reach this Saturday's final, which will be played between New Zealand and Australia in Wellington. We report all the news from the Super League, the Championship and League One. And we preview the 2015 season for Castleford Tigers and for Hunslet Hawks and Swinton Lions. 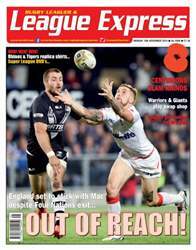 We give our readers the chance to win a 2015 replica shirt for both the Tigers and Leeds Rhinos, while we also have a competition for a DVD covering the 2014 season. And, in the latest in our series on members of the Hall of Fame, we check out the career of Ellery Hanley. We have all the news and comment from the amateur game, and we have our regular pundits, our editor Martyn Sadler, Hall of Fame member Garry Schofield, Gareth Walker and Malcolm Andrews, while Richard de la Riviere looks back at this day in Rugby League history.